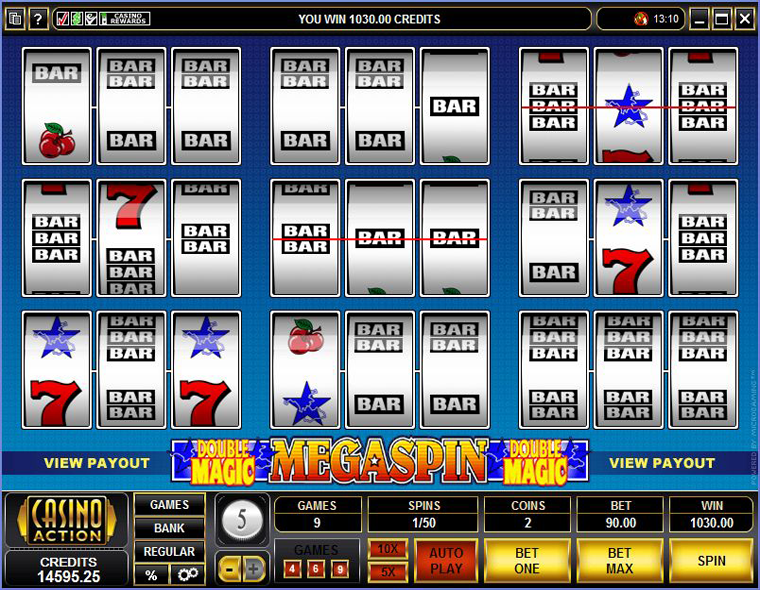 Mega Spin – Double Magic is different from other machine in the fact that you spin multiple reels per one gaming session. At its core, the slot is a Vegas-style fruit machine equipped with three-reels and featuring basic classic symbols, but it offers even more winning opportunities as you can now play nine games at the same time. The slot offers straightforward graphics, simple gameplay and some basic features to appeal to three-reel slot enthusiasts. Mega Spin – Double Magic is playable for free, without any downloads required. 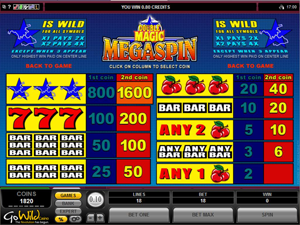 When starting, you will see 9 three-reel one-payline slots placed on the same screen. In the controls panel you can choose 4, 6 or 9 slots to play at once; and when adjusting betting options, you automatically apply them for all the games in front of you. A coin denomination runs in a wide range of $0.10 and $5, with one or two coins permitted per line, per spin. All your choices influence the size of the total bet on all nine games, which can reach $90. The floor bet, with one coin wagered, amounts to $0.90 on nine games. Being a Vegas-style machine as such, the slot incorporates classic symbols, including cherries, single, double and triple bars, sevens, and theme-specific Blue Star icons. After clicking the Spin button, all the machines start spinning in parallel, but after they come to a stop the combinations created (if any) do differ awarding their own prizes. The lowest-paying symbol is a cherry. A combo formed with one cherry and any other two symbols grants 2 (4) coins. If two cherries are used in a combination, you get a win of 5 (10) coins. Single, double or triple bars award x10, x25, and x50 times a bet, for three of a kind. A mixed combination of bars (e.g., one single plus two triple bars) pay out at x3 times a bet best canadian casino. The most lucrative regular symbol is the Seven, with three of them on the payline yielding 100 or 200 coins if you stake one coin or two coins per line, accordingly. These seem to be fairly low payouts, but they are just for one game, so you can grab up to nine such awards in a spin. The Blue Star symbol represents a wild that can act as a substitute for other icons to form a winning combination. When a combo is created using a wild symbol as a substitute, your award is worth twice as much. When a combo is created using two wilds as a substitute, your award is worth four times as much. Furthermore, a wild grants its own prize of 1600 coins when you bet 2 coins. So playing at a $5 bet, you may take down $8000 for the combination of three wilds displayed on an active payline. 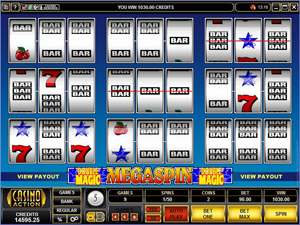 MegaSpin – Double Magic has a total of nine games on a screen giving you an ultimate gaming experience with a Vegas-style twist. There is a wide betting range available, so the slot is great for gamblers of all budgets.